Click here to view student work from the 2004 Art as Light competition. Art as Light began as a commission by Dr. Donald Fraser on behalf of Boston University for an installation art work by Hugh ODonnell to celebrate light. A 144 inch x 168 inch digital window was created for the St. Marys Street entrance. 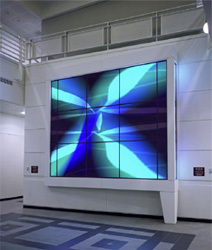 The image was created in the computer and printed with an RGB laser onto photographic film and is based on a growing luminous form that symbolizes the genesis of light as a creative force in Art and Industry. Each year since that time students compete to produce proposals for installations that utilize light as an integral part of their expression.